Mr. Squash and I were out working in the yard today. What a treat from those long days inside all winter! Since I haven't been able to show much of what I'm quilting these days as yet, I thought I would take you on a little walk around our yard. 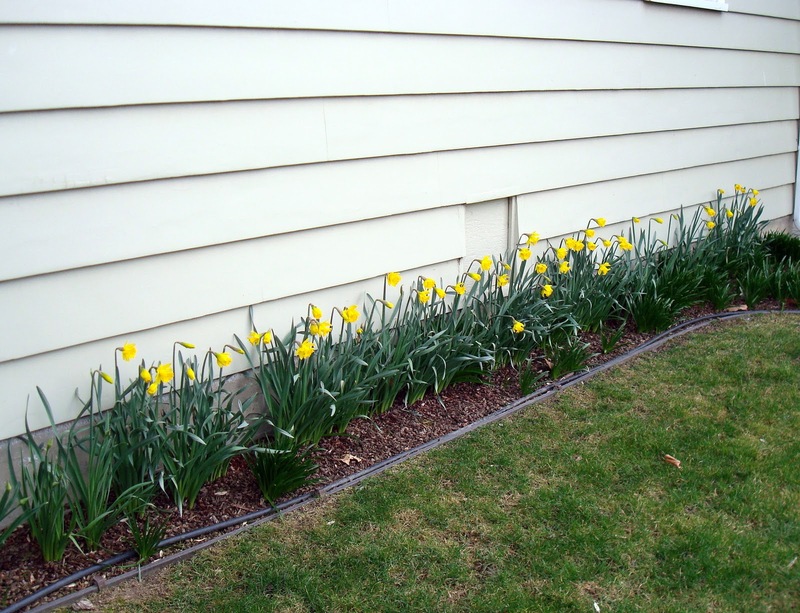 Daffodils on the south side of the yard are just about completely opened. 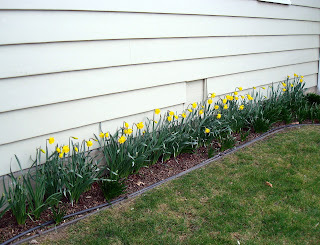 The smaller green plants below them are grape hyacinth which seems to bloom much later. Mr. 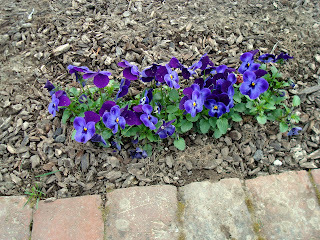 Squash needed some plastic pots, so we bought a flat of violas. Why didn't I save all those pots from last year! 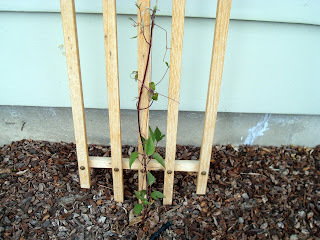 I planted a couple of masses around the yard for a punch of color, then the empty pots were used to transplant his New Jersey tomato seedlings. 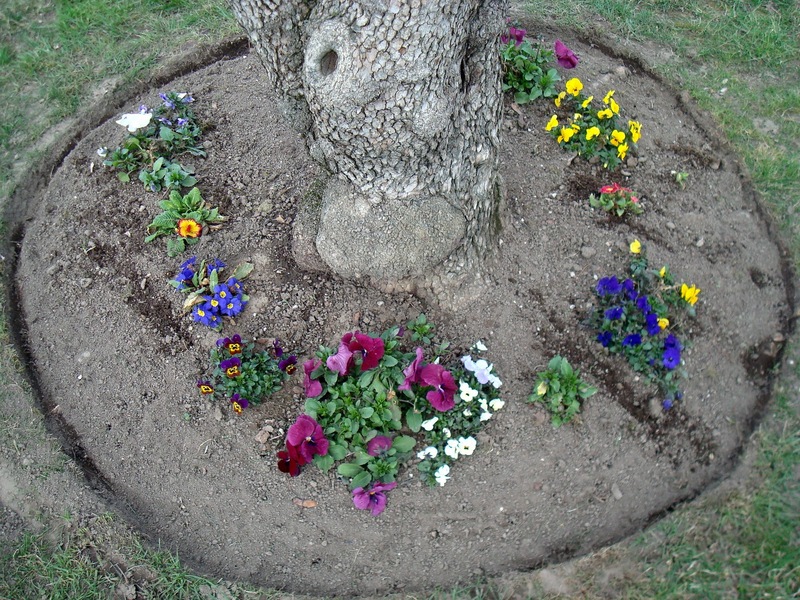 Miguel mowed the lawn yesterday for the first time this year and also edged around the four dogwood trees. 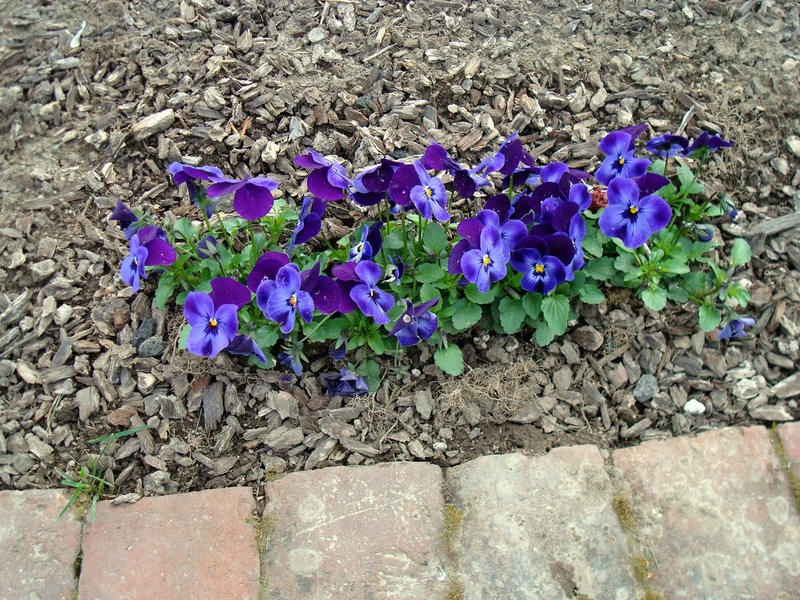 Last fall I planted a bunch of winter pansy's and violas under them and along with the primrose I planted last spring, everything wintered over really well! 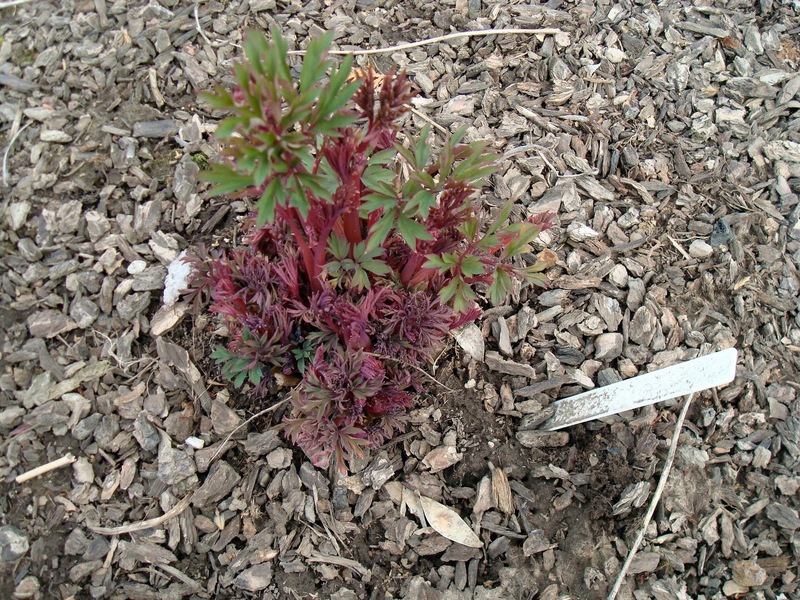 How I love Bleeding Heart (Dicentra)! 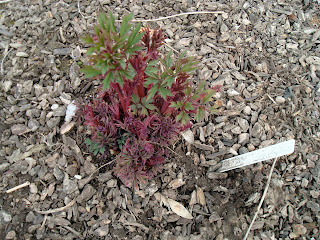 This guy also wintered well and promises already to be twice as large as last year! 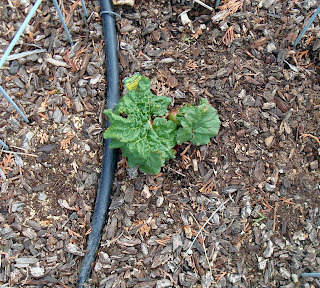 We got a lot of fresh rhubarb from our friend Carol last year. It was so good that I decided I wanted one of my own. This plant was moved 3 times and stomped on by raccons, but it seems to be coming back just fine! 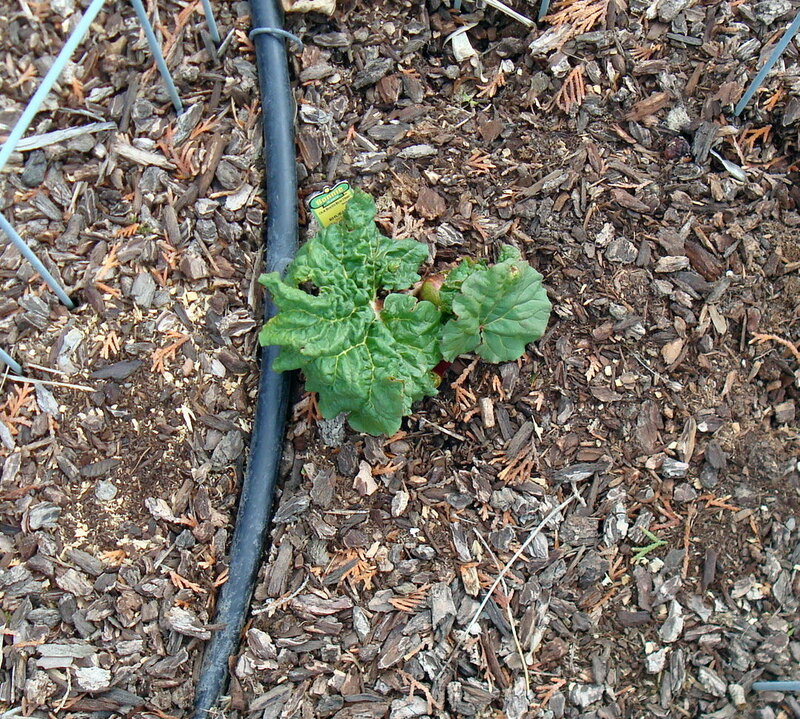 Soon I'll be making rhubarb crisp! 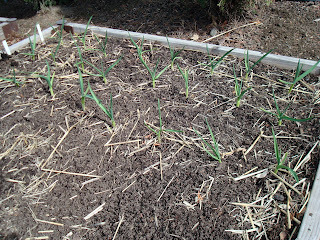 In the Fall I planted Chesnok Red Garlic - a hard neck variety - one of our favorites. 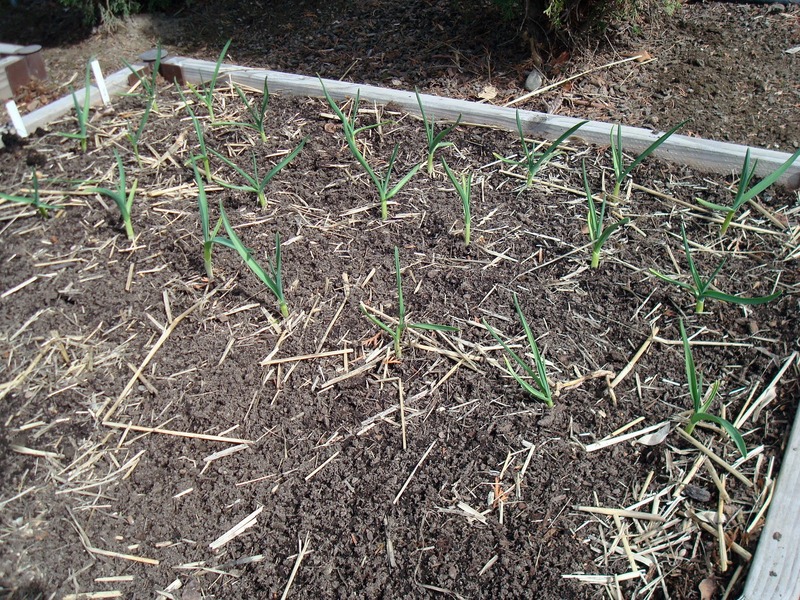 We removed the straw from the bed today and look what we have - every one germinated! 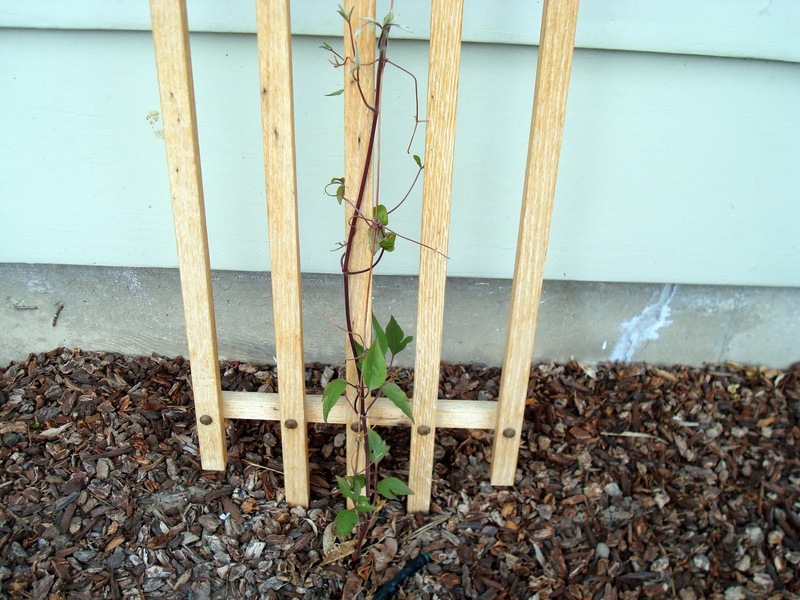 Another new addition last year were two Clematis, both named for my SIL and her husband! Even with a heavy frost the other night, they're going strong! Here is Barbara. When she beginns climbing she will have the most gorgeous magenta-colored flowers! H. Bernard, the other Clematis, is having a slightly slower start, but when he gets going his white flowers shine! 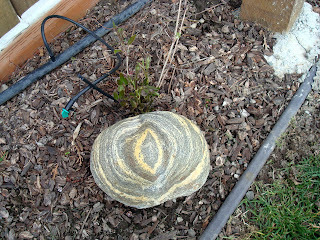 Clematis like their roots to be cool, so I try to place some of our large, collected rocks around them. This rock came from a fun day fishing on the South Fork of the Sauk river one July day a few years ago. 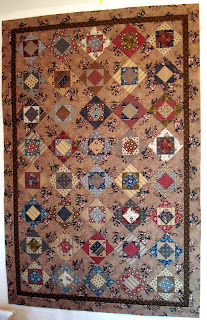 On the quilting front I'm marking my New York Beauty and getting ready to put it on Vinnie. 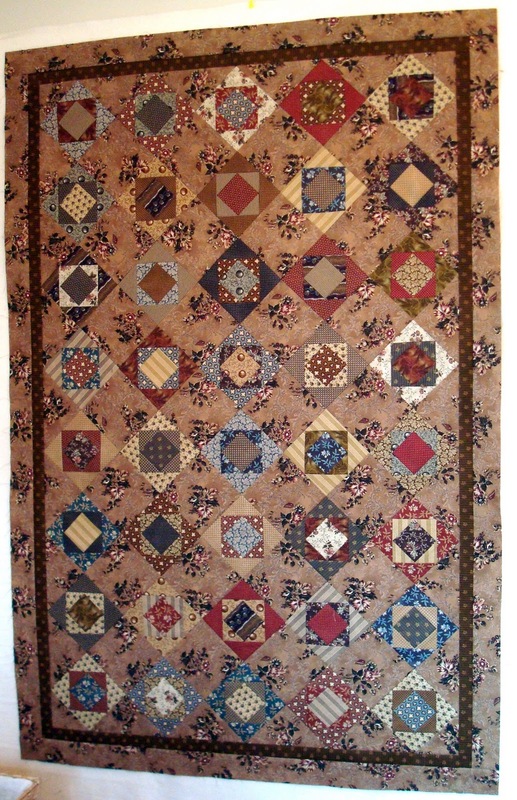 I was going quilt it with a pantograph, but it screams for something custom, so I'm taking the plunge! I decided I'd better make some chalk markings to help guide me first. I'd rather do that than pick out stitches any day! 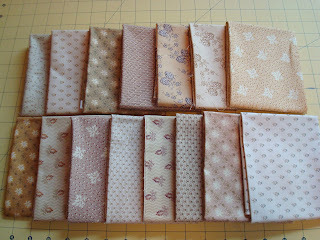 I also have a couple of "Supreme" projects ready to show you - Stephanie should be releasing the patterns soon. 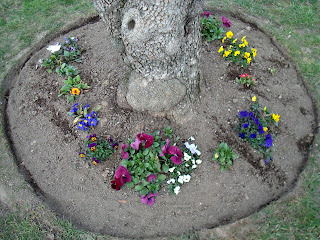 Tomorrow we're off to a large craft show - looking for some fun garden art! 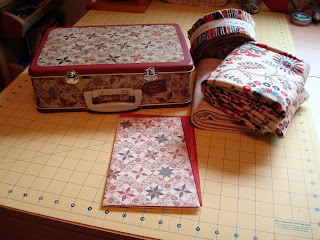 Right before we left for the beach I decided to load Baby Rose on Vinnie and start quilting. Within an hour I totally suprised myself and finished it - all freehand! Well....I must admit that first it is a small quilt, and second - stippling and outlining are pretty easy, but for me this is an accomplishment, and it makes me feel confident to load the other quilts in waiting! 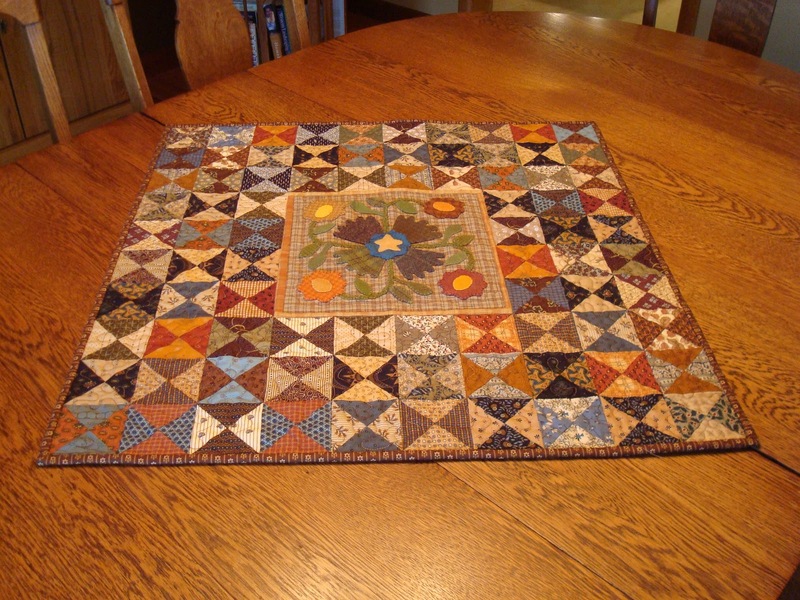 It makes a perfect topper for our dining room table! 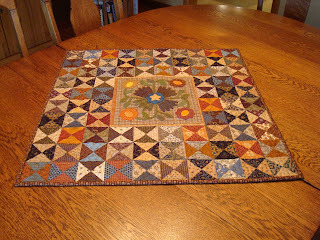 Here is a close-up of the center. There wasn't much room but I needed to anchor the wool applique, so I ditch-stitched the tiny border and then lightly outlined the applique. Had I been a tad more practiced, I might have squeezed another row of outlining in, but that's another quilt and another day! 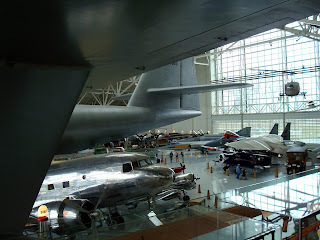 A few of you guessed that the photo in my last post was the Spruce Goose! 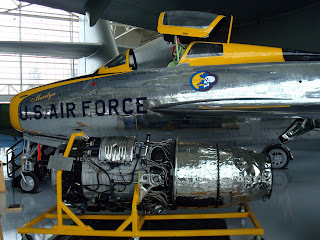 We visited the Evergreen Air Museum in McMinnville, OR on our way out to the beach last week. Mr. Squash and I were there right after it opened in 2001 and had not been back since. The Spruce Goose is housed inside this enormous building along with lots of other planes depicting aviation history. 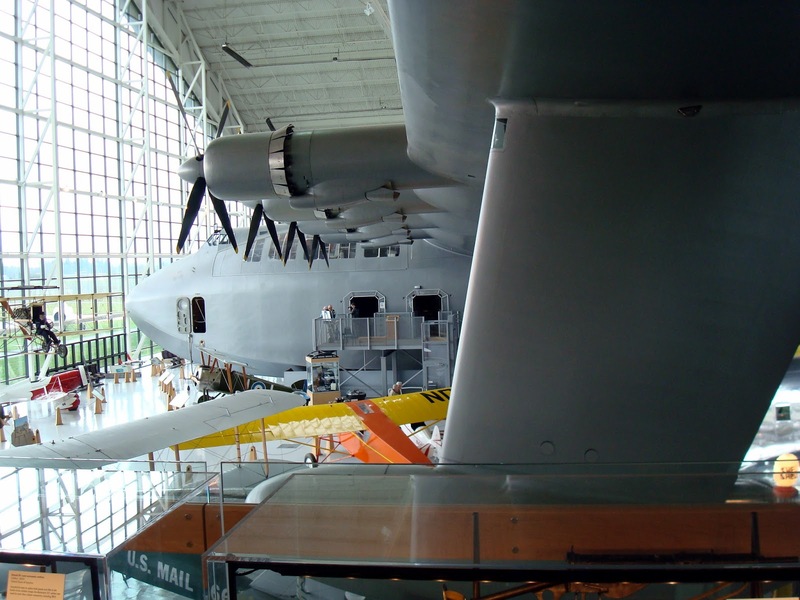 For those of you unfamiliar with the Spruce Goose, Howard Hughes had a contract from the US Military to build a large, sea-plane type carrier for WWII. It was made entirely of wood and painted to look like metal. Unfortunately he was unable to fine-tune the plane for flight before the end of the war. 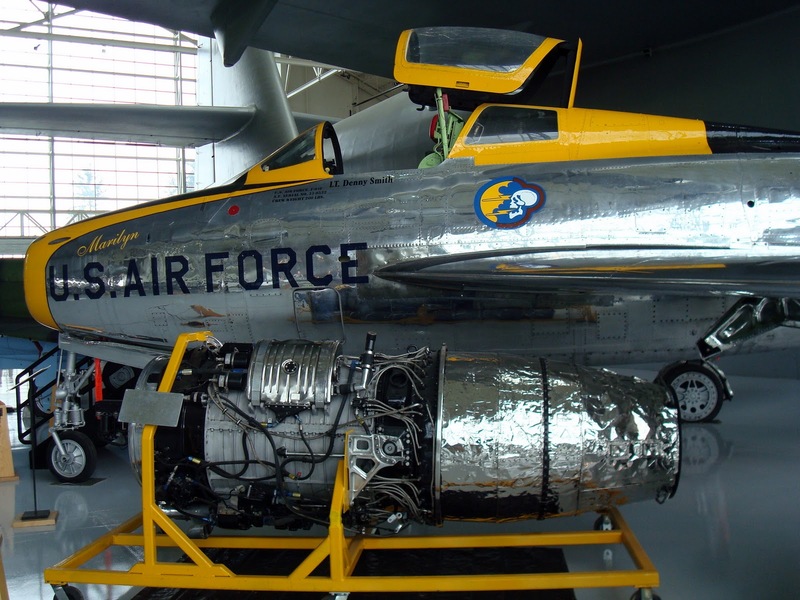 The plane was taken apart in pieces from its previous home in Long Beach, CA and reassembled in McMinnville. This is the tail of the Spruce Goose - it's nearly impossible to take a photo of the entire plane in one picture! The DC-3 in the foreground of this photo is the first plane I ever flew on many years ago. Mr. Squash flew on them when he was in Peace Corps in Nepal. He likes to tell the story that they were so rickety it sounded like someone was foot-pedaling the plane down the runways! 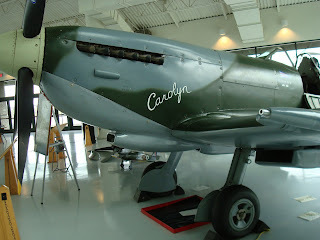 I love how servicemen in WWII named some of their figher planes after their wives or girlfiends! Don't know if Marilyn here was a wife, girlfriend or the famous Marilyn Monroe! Our last stop on the way home from the beach was Boersma's in McMinnville - where I purchased Vinnie! Wow - what a treat! 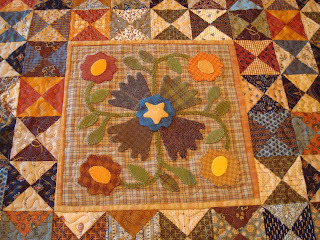 Everyone was at a quilt show in Portland that day - we were the only customers in the store at the time. The counter gal gave us a personal tour of the entire building including the fantastic longarm classrooms upstairs! I could have spent hours (and lots of dollars) in the fabric area, but my studio is stuffed to the gils right now. However, Mr. Squash bought me this really neat lunchbox kit of Collection for a Cause - Hope - by Howard Marcus. It's just perfect for our bedroom and I might just make it next! I love the lunchbox - slightly larger than the kind I carried to school as a child and perfectly sized for picnic lunches for the two of us! Mr. 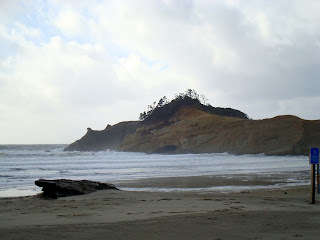 Squash and I decided early last week to drive out to the Oregon coast for a few days on a spur of the moment getaway. It has been a long winter and quite a while since we saw the ocean, so we thought this would really lift out spirits! We knew there were several consecutive storms set to hit Washington and Oregon over the following week, but we didn't mind - bring on a good storm, we say! We left the Squash House early Wednesday morning, reserving a room at the Inn at Cape Kiwanda in Pacific City, OR for two nights, then drive home on Friday morning. (If you click on the link they have a live webcam in the upper right corner of the home page.) The drive out wasn't bad until we hit the McMinnville area where the wind really started to kick up. By the time we got to the beach the rain and wind were coming down sideways with no letup whatsoever! The news that evening said the coast was receiving sustained winds of 40-60 MPH! 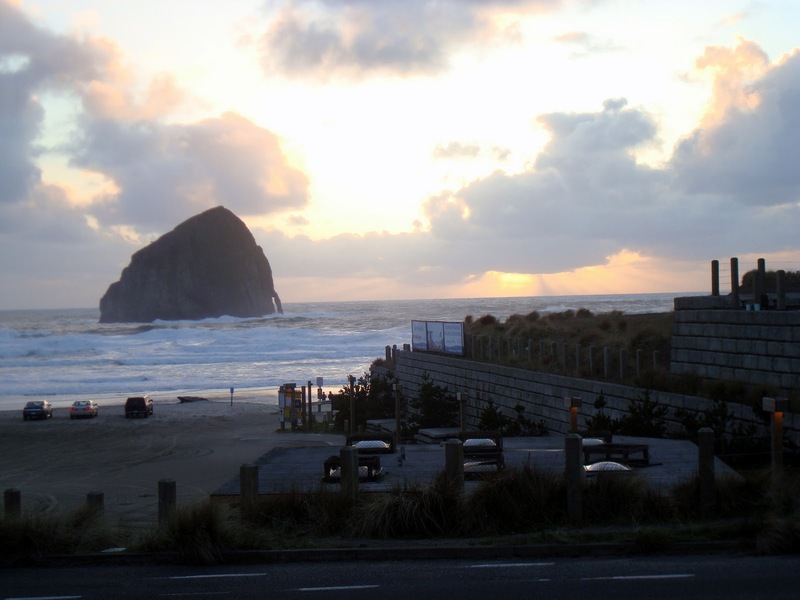 The photo above of Haystack Rock was taken from the balcony of our room after we arrived at the hotel. Mr. Squash was holding onto me while I took the picture so the wind wouldn't sweep me off the deck! The rain and the wind continued all night long, but we were cozily tucked into our lovely room! Thursday we had a fantastic day! We drove up to Cape Lookout and down to Lincoln City regardless of the continual high winds, but at least the rain had stopped and there was partial sunshine! 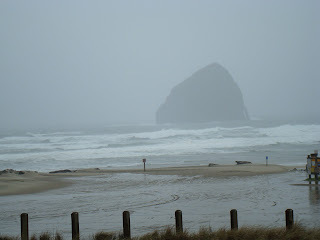 The picture above was taken on Thursday - this is just to the right of Haystack Rock. 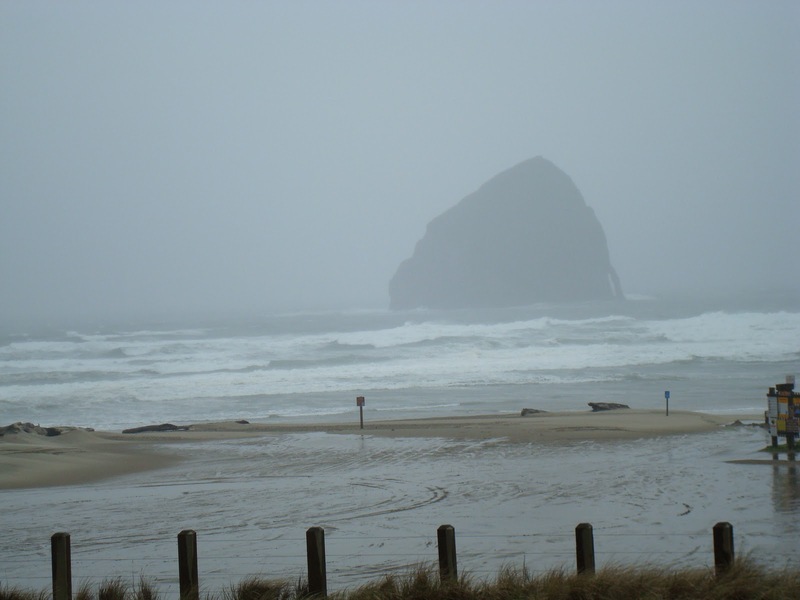 To give you an idea of just how hard the wind was blowing - waves were crashing up and over the two nubby points on the left of that bank which was nearly as high as Haystack Rock! I took this photo just before the sun went down on Thursday evening - it is behind those clouds low on the horizon on the right. Even the wind had calmed considerably at that point. Little did we know what was in store for us early Friday morning! We awoke to the sound of the bedside phone ringing and a loud siren blaring just before 5:00 AM! Mr. Squash got off the phone and said there was a Tsunami expected to hit in two hours and we had to leave. Having both taken emergency certification training, we knew this was no joke. The hotel desk had received a reverse 9-1-1 call and they were calling each occupied guest room to give us the news. We also had no idea of the earthquake that had taken place in Japan. So within 40 minutes we were showered, packed and on the road in total darkness! We had seen the Tsunami Evacuation Route road signs all over the area on our travels the previous day - little did we know we were going to have to follow them! The only problem we had was finding our way to the proper evacuation route! It was so dark that we missed the cutoff - and got several miles down Hwy 101 (the non-recommended route) before we realized our mistake and turned around. Once we found the road it was a while before we realized we had taken the correct route! But 90 minutes later we found ourselved settled into Starbucks in McMinnville, safe and sound! Whew! What an awakening! But - adventure seems to follow Mr. Squash and I frequently, and we most definitely stayed true to form on this trip! Thank goodness most of our coastline was spared anything as horrendous as the devastation in Japan - our hearts go out to everyone there. I'll have more about our trip next post, which includes this plane....anyone know what it is?